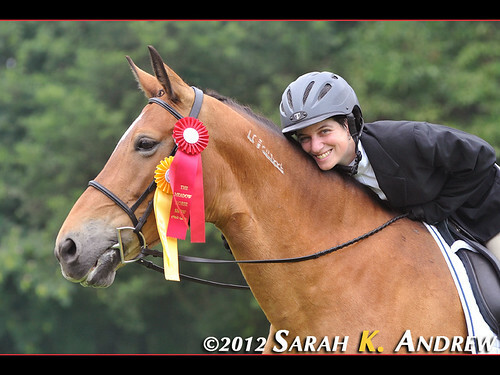 Huge congratulations are in order for Kris and her mare Sunny (Helping Hearts Equine Rescue alum and BLM Mustang). They did a fantastic job at their dressage show, scoring a 64% and a 63% in their Intro tests! After the show, Wizard and I went out for about an hour and a half with Christie and Brigid. We mostly walked since it was pretty muggy out, but we did a little trotting, and I even let Wizard break into a canter at one point. It was our first canter in MONTHS- it felt sooo nice. We rode out through a creek, past the sheep farm, and down part of Roosevelt St. Wizard got a little amped up when we were trotting behind Brigid, but he was perfect for the rest of the ride. We need to keep working on it. He used to be insistent upon being in the front at all times. He’s a million times better at the walk, so now we need to work on other gaits. Wizard and Brigid continue to be a nice trail riding pair. She was very amused by his antics in the creek. He was pawing like a dog, and then she put her snout in the water and started blowing bubbles.